The Four Evangelists by Peter Paul Rubens, ca. 1614. From left to right, Luke, Matthew, Mark, and John. 402 people in our community are currently praying with you. 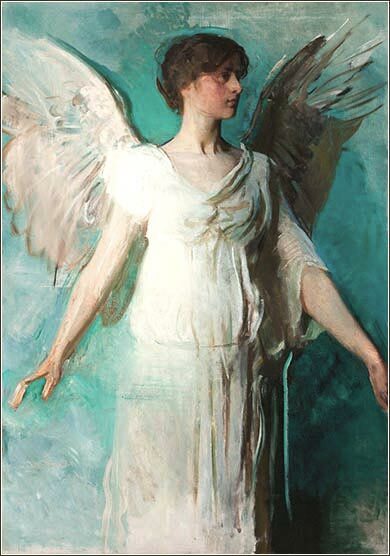 Abbot Handerson Thayer was known for his portraiture of young women as angels. Here he sets skin tones against popular colors of Art Nouveau, shades of olive green and turquoise, with great attention to shadow and texture. Jesus left there, walked along the shore of the lake of Galilee, then climbed the hill and sat down. And great crowds came to him, bringing with them people who were lame, crippled, blind, dumb and many others. They simply put them down at his feet and he healed them. The result was that the people were astonished at seeing dumb men speak, crippled men healed, lame men walking about and blind men having recovered their sight. And they praised the God of Israel. “Where could we find enough food to feed such a crowd in this deserted spot?” said the disciples. “How many loaves have you?” asked Jesus. “Seven, and a few small fish,” they replied. Then Jesus told the crowd to sit down comfortably on the ground. And when he had taken the seven loaves and the fish into his hands, he broke them with a prayer of thanksgiving and gave them to the disciples to pass on to the people. Everybody ate and was satisfied, and they picked up seven baskets full of the pieces left over. Those who ate numbered four thousand men apart from women and children. Then Jesus sent the crowds home, boarded the boat and arrived at the district of Magadan. More than two years have passed since then. The Biblical narrative of those years is sporadic. In fact, by combining the timelines of the four Gospels, we can tell that roughly six months have passed since Jesus healed the Canaanite woman's daughter in the preceding verse! We can see, however, how Jesus' ministry has matured by comparing these verses to Chapter 5. In today's lesson, Matthew describes Christ's love, exhibited in physical action. Christ heals countless severely disabled among the faithful. After three days of solid work, He realizes that they are hungry and will be distressed when the meeting is over, and so He performs the second miracle of feeding. Matthew, a careful taker of notes when Christ taught, records no discourse during the event. Christ has taught — often sternly — but now, there are a cadre of believers who have already heard and accepted his teachings. Then was the time for teaching; now is the time for those who have heard and accepted the teaching to reap a benefit. One can see a very broad lesson by stepping back to “see the big picture”. Christ teaches; those who have learned his teaching are now able to accept his love. As He promises in John 14:23, “Anyone who loves me will obey my teaching. My Father will love them, and we will come to them and make our home with them.” So in today's passage, He demonstrates the second part of his promise. We have mentioned several times that Christ's miracles, during his life, were most often signs to the faithful. It doesn't seem that they were generally performed to convince people to follow him but as signs of his divinity for those who had already taken him into their hearts. (In fact, He says that He did little healing in Nazareth because of the lack of believers. Mark 6:5) They were a physical demonstration of the power of his love for those who would follow him; ultimately, He will show his power over death itself by his greatest sign, the Resurrection. The miracles of physical healing He performed here and throughout his short ministry were preliminary or temporary in nature, for it was not the physical body God sent Christ to perfect. He will show a degree of disregard for earthly existence by giving his own body over to torture and execution. Healing bodies and minds is, one might say, the warm-up act, for He has something infinitely more important to give us: the healing of our very souls, which will give us eternal life. Matthew does continue with discourse over the next few chapters, but nevertheless, we can follow the specific pattern of Christ's teaching by the general pattern of Matthew: Teaching, believing, repentance, obedience, love, salvation.